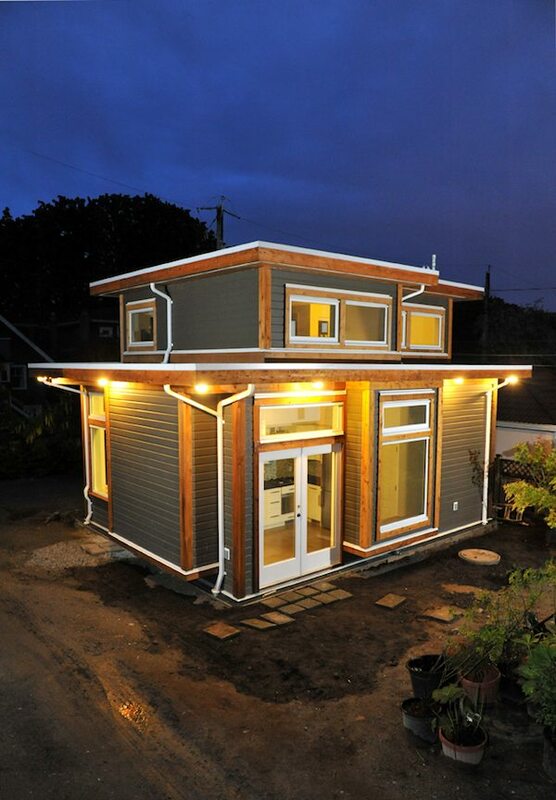 Meet Brendon and Akua who built a 500-square-foot small house in Vancouver, British Columbia, Canada. The home was designed and constructed with the help of Smallworks Studios / Laneway Housing in Vancouver. A while back we featured Paula and Skip’s 500-square-foot home from Smallworks Studios which you may also like. Brendon and Akua went with Laneway’s West Coast Loft model which features a loft bedroom, luxurious kitchen, living area with balcony, and a garage. They built it in Brendon’s parent’s backyard so they didn’t have to buy additional land. Since it has a flat roof you can easily add solar panels or even a living roof. To explore more amazing small homes like this, join our Small House Newsletter. It’s free and you’ll be glad you did! We even give you free downloadable tiny house plans just for joining! When you go upstairs you’ll see the living area, bedroom, and of course the sliding glass door to the outdoor balcony. Below is another angle of the same area. I’d say they made great use of space with this design, wouldn’t you? Another feature that I like a lot about this small house design is that there are lots of windows so you can get plenty of natural lighting throughout all parts of the home. Below you can check out the floor plan for both levels. If you’re interested in learning more about Smallworks Studios & Laneway Housing check out their site which features more designs and photos. To learn more about Brendon and Akua and their little home visit their blog. They’ve got plenty of interesting blog posts to explore related to their new humble home. If you enjoyed this small house design, please “Like” and share using the buttons below then tell us what you liked best about it in the comments. Do you have any ideas to make this design even better? We’d love to hear them. Thanks! Also – please join our Small House Newsletter – you’ll LOVE it! There is some controversy about laneway housing in Vancouver but I love the idea. If we could afford it I’d convert our garage to add living space so my younger son could move in to my basement apartment and I’d move into the new place. We already have 4 generations in the main house in our own apartments and there’s no more room left there. Most houses in our area already have large garages and some look more like tiny houses, if not quite as high up as these. I’d prefer a large open space for kitchen and living rather than having them split. Bedroom optional, though a separate room for sewing would be nice. Some day? Closets are where the back door is located. I totally agree! Open concept homes are in demand. The garage area would be a great crafting space, an office, a man cave, the possibilities are endless. I dream of a small house that has a four season walk-in closet as well as an attached garage…with a great view with a bank of windows and cozy seating….I love this kitchen. I’m thinking i need to design it myself! Happy New Year! Отличный проект дома для двух человек. И гараж с верандой – все продумано – молодцы! Спасибо, интересно! An excellent house project for two people. And the garage with the veranda – everything is thought out – well done! Thanks, I’m interested! Excellent. It was so nice to see this today in drought stricken Arkansas. I think having the garage as a home office is great idea. I just recently started living “simply” and I love it. Living simply makes me feel less stressed, people said it would but I didn’t believe how it could, but it really does! I would love to get a small house like this someday. Currently we are living in an appointment until we figure out our career paths and where we plan on living! Nice. Looks rather roomy for being only 500 ft. I’d be willing to sacrifice a foot or two of the balcony for just a little extra bedroom space. But that’s just me. Making the bed would be impossible for me! I was wondering what the perimeter was and dimensions of the rooms? I would LOVE this for my mother to where she can be close. Wonderful house. Great home with one enormous flaw….bedroom upstairs and bathroom downstairs. Think about getting up in the middle of the night half asleep and having to walk down a flight of stairs? Really? Beautiful – and one of the nicest things is that the living space is not dominated by a TV, wonderful!! I agree with Marianne that the upstairs needs a bathroom (or 1/2 bath, at the very least). In fact, it’s the first thing I thought of when I saw the pictures of this house. I would much rather have an upstairs bathroom than a balcony. Another thought: Is it a good idea to have elderly people living in this tiny house someday? Stairs are difficult to maneuver for the elderly, and I just don’t think I could ask my parents to do that. Otherwise, this is a great design, and an ever greater idea to put it in their parents’ back yard! Homes are like Steak and everyone wants it served differently! I think that for this couple, they designed the house the way that THEY needed. With NO disrespect to them, this is how I’d alter it for MY needs…with some comments first. 1) Garage or No Garage, that is the Question. Well, if you live in a very urban area with tight parking, that garage is a Gold Mine! Anyone hear about the parking space in San Francisco that is 8′ x 12′ and sold for $82,000.00?!?! At $50 bucks a pop for a parking ticket, that garage can save your arse if there’s no on street parking available. Now, if this is in an area with tons of on street parking, then that’s a different matter entirely. I’d build a wall parallel to the Mechanical Room and turn that space into a wee office/guest room. I’d then flip the Bathroom/Mechanical Room and have the guest room/office have access to the bathroom with the mechanical room access at the front of the house. 2) The main floor floor plan has been changed since the sketch. The kitchen now comes around the corner with the frig, there is no “island” (I guess that’s what’s sketched) and it goes directly to that grand window in the kitchen. Perhaps they thought the island would restrict space? One on wheels would be handy, though. 3) Now to the Bathroom-less upstairs. Since I moved the living room downstairs, that frees up the miserable tiny space that a mattress was shoved into…to become the UPSTAIRS BATHROOM!!!! Which overlooks the deck!!!!! Yeah! I can’t stand balconies in homes that overlook spaces (what.a.waste.of.squarefootage! ), so I’d enclose that space and make the former “living room” an amazing bedroom with tons of storage space for clothes which 4-Season home owners need! Now, the upstairs has a bathroom, great closet space and the deck remains. 4) One last comment: are my husband and I the ONLY TWO HUMANS that need/desire/ night stands???? 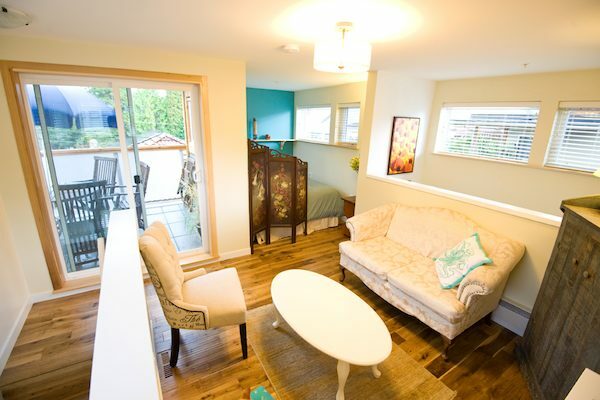 In Tiny Home after tiny home, I see the futon/mattress pressing right up against the walls of the loft or alcove…where the hell do you people put a) your current book? ; b) a lamp? ; c) a box of tissues? ; d) a glass of water?and the friggin’ e) ALARM CLOCK???? ?…and that’s under normal circumstances! When sick, where’s the place for a thermometer, your medicine, more boxes of tissues and perhaps a space for a wee posy in a bud vase? Come on, we can’t be the sole people who need a space for a clock and lamp, are we? So, I solved that issue by doing the switcheroo. We could be quite happy in the space as I changed it for our needs. So a little sketch would help your explanation.. All of which is right on in my opinion. Of course that is why I am doing the Park Model format at 4Fathoms Designs on FB. For some reason I often wonder on where the designers are spending their senior years. NEVER a bedroom without a bath on the same floor(I always have at lest 1.5 in all my designs now… Come to think about it I have ALWAYS had 1.5 bath since the 60’s when I started designing and building . Cahow, I absolutely agree with everything you said, and the part about HAVING night stands (YES)….but the SPACE on either side of the bed is needed. HOW IN THE WORLD do these people make the bed while crawling on top of it? I KNOW you can mount lights on the wall, and I GUESS you can put a shelf on the wall, but….making the bed? I MUST have at least a foot on either side of the bed…preferable 18 inches. Maybe no one makes the bed anymore. I may be out of touch in my old age! I’m completely with your comments….Completely! Thanks! indeed prefer making the garage into living room, upstairs living room to more bedroom, bedroom in there seems too closed in just enough for leg room, then ofcourse don’t need too spacious bedroom only there to flop down and sleep! 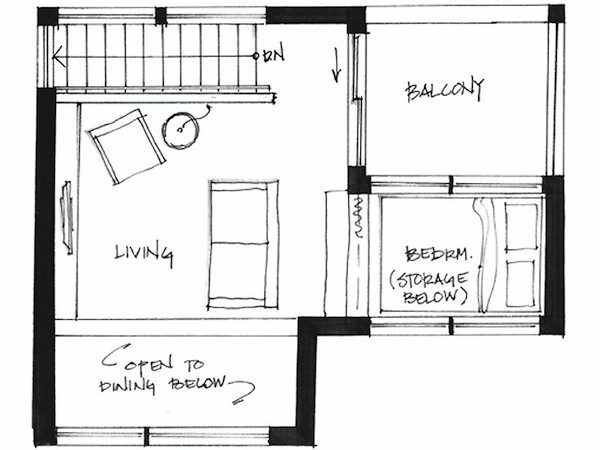 balcony has more room than the bedroom switch, turn the small space bedroom to walk-in/storage closet! there’s enough room outside make driveway for the car fence with seasonal canopy? Laneway houses in Vancouver have to build within some tight guidelines, the number of off street parking spaces for that lot being one, and they usually replace an existing garage. That’s why they often have a garage built in. A clever architect can come up with a designated garage space that can also function as living space if done right while still fulfilling the legal requirements. You have to remember that these are auxiliary living quarters, just like having a rental or in-law suite and will never be sold as a stand alone property separately from the main house. I Love This one!! Can I have it NOW.!?! I agree with making the garage the living room because (living in the country) I really have no need for a garage aside from protectin my car from harsh elements (which I’m none too worried about). Knocking out the door leading into the kitchen and the garage door, I’d add in a sofa (or two for company), chairs, and a coffee table with a nice rug. I’d also knock out the door leading from the garage to the outside in favor of a glass semi-wall. I’d also trade out the mechanics room for a landuray/linen/mud room. With the now freed up upstairs, I’d have a full bed moved up against a wall, a chair or love seat, and some shelving, a small stock of drawers, a nightstand, and a wardrobe to serve as my closet for hanging nicer clothes. I’d convert the previous bedroom into a small office/study for work by adding a glass door to the entry (for privacy) instead of taking away some of the balcony. Oh, Vancouver…how insane you are. Median price for a Smallworks unit: $290,000. We are seeing more of these all over Vancouver and they are all quite different. The city insists that the home owners have two dedicated parking spaces as well. One of these in my neighbourhood has a grass living roof. I love these tiny houses!!! i normally love tiny houses. what i do love about this home is it is twice the size of many tiny house, which means it would be achievable for me to live in permanently. I am not sure what the climate of Vancouver is, but in my city, the outside living is larger than would be used regularly. For me needs, I would rather have more inside space. the garage takes lots of room, but is there to meet building regulations. and finally, I would try and juggle the relationship between the kitchen, living room and bedroom. thanks to the owners for sharing their home. What was the cost? Could a bedroom be put on downstairs instead of the garage? I love the Tiny House concept. However, most seem to be geared to young singles or younger couples. I would LOVE to see some geared to the older generations. My husband & I are both 65. We have lived in the same 1400 sq. foot, one story house for 29+ years. It has a double garage full of ‘Stuff’ not needed or rarely used. Huge kitchen, dining room, front room 3 bedrooms plus a den. We basically live (use) less than half of it. I would like a small bit of land to build our own ‘T House’ – probably 500-600 sq. ft. and a one car garage. (Not included in 500-600 sq. ft. 0f living space. A community of Tiny Houses, built for the older generation, is something I think would be extremely practical and popular. We have different needs and concerns. I, personally, would like solar plus on grid hook up. A real bathroom – shower, sink and toilet that is not compost. Internet/TV via satellite dish. Water . . . Depend on where the Community was. I have no concerns about living in a different state. Would love parts of Colorado. Trees, views, and privacy. But, close enough to a larger town for the needs of a Senior. This is a group that needs to be tapped in to. Seniors who want/love the Tiny House concept. We have the $$ (normally) from selling our homes. But, are NOT interested what is available now. Senior gated communities that have flimsy modular homes and outrageous ‘rent’ per month. We are not interested in Senior only apartments – shared walls in our younger years – that was enough for us! Are there any Tiny House Companies/Builders and areas that are geared for the older generation of wanna be Tiny House owners? Agree about nightstands and closets. I love the design but as I’ve gotten older I no longer care for stairs and a bathroom close by is handy for those middle of the night trips. Pee bottle and porta potty is ok for my camper but not at home. I built our 520 sq ft cabin 30 years ago and put the loft upstairs and the bathroom downstairs. Seemed like a good idea at the time but for the last few years we have changed the living room to accomadate sleeping and I seldom go upstairs. To do it over I would think ahead and put everything on one floor. What would the cost be for building such a 500 sq ft house? I LIKE THE WARM COLORS IN THE BATHROOM AND THE BATHTUB FOR NICE BUBBLE BATHS. AT NIGHT IT DOES HAVE A LIGHTHOUSE APPEAL!!! KEEP THEM COMING!!! Reminds me of a house I once seen up in Georgia, nice little spot to…! 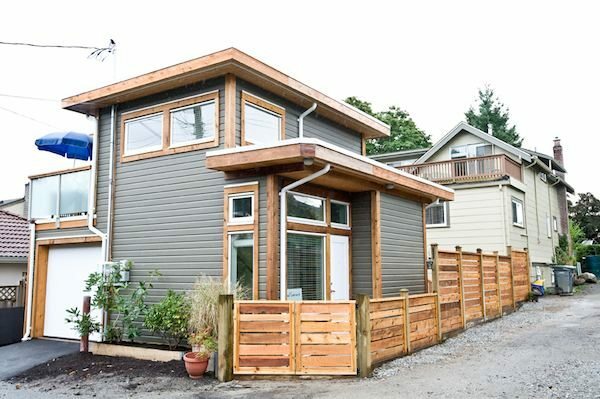 I have seen 2 laneway houses in Vancouver and thought that the layout/design concept was ridiculous. In both they had these huge kitchens and tiny living rooms???? Why, oh why would you need a large kitchen when there will probably only be 2 people living there? Also they had regular doors (rather than a pocket door) on the bathroom, so it was almost impossible to get in. Also had those dreadful (impossible to clean glass shower doors) so the space being so small, it was difficult to keep the bathtub clean…..what is wrong with a regular shower curtain? Designers, stop putting in these terrible shower doors….. There will be planning rules around what the owner can and can’t do. I think that Vancouver requires a garage to be part of lane way houses… And simple comments, like smaller deck, larger living – might not be possible because of the requirements of the city planning department. I would love to network with the community to gain more knowledge and possibly help on a tiny house. I want to build tiny house for life. Thank you for the great information your site is awesome.